A late friend of mine had a crystal ball. This was in the 1970s—the Age of Aquarius—when rock crystal spheres could be purchased from ads at the back of occult publications. One day, as we were hanging about his house, I idly picked up the ball and gazed into it. I did not expect to see anything more than a distorted or reversed vision of the room. To my amazement a picture appeared, as if on a tiny television screen deep in the heart of the crystal. It was of a woman with dark hair, parted in the middle, dressed in garb that I thought could be Calabrian: she wore a long skirt with (I think) an apron, and a folded cloth headdress. She was kneeling, kneading bread or grinding corn on a stone. I could not tell which; I only saw the repetitive motion of her arms and body as she pressed forward with her hands. I watched this scene only briefly, shocked at what I was seeing: a miniature human being apparently going about a domestic task in a completely natural manner—inside a crystal sphere. I simply couldn’t comprehend it. I put the ball down and have not looked into a crystal since. The Spiritualists, more open than I to any method of communicating with the Beyond, added crystals to the planchettes in their clairvoyant tool-kit, although we seem to hear more about planchette. But in Lancashire, home of the Pendle Witches , hundreds of Lancastrians (of the lower classes, the narrator hastens to add) apparently spent their leisure time gazing into crystals, spying on their friends and relations or scrying the future. Mr. P. was born in Manchester, of parents in humble circumstances, and in Manchester and its neighbourhood his childhood and youth were spent. The first thing which awoke his curiosity regarding crystal-seeing occurred when he was about seven or eight years old. One of their neighbours went to enquire after the well-being of her son, from a seeress in Copper Street: the young man enquired after, was a soldier, and stationed at a distant place. The seeress said, that she in her crystal beheld the young man standing in a line of soldiers. Upon this she handed the crystal to the enquiring mother, who, greatly astonished, also quite clearly perceived her son, and observed that he came forth from the line and stood in front, apparently as if to observe her. The mother’s surprise was naturally great, and upon subsequent enquiry from the young soldier, it appeared that he had at that particular moment acted precisely as witnessed in the crystal. This circumstance was much talked about amongst the neighbours, and was frequently referred to by Mr. P.’s mother. A man named Clegg, who was well known as a Methodist preacher, travelled as a canvasser for a clockmaker; indeed, both he and Mr. P.’s father travelled for the same tradesmen. Thus the two wives, Mrs. Clegg and Mrs. P., were acquainted, and often met. Next door to Clegg’s wife lived a woman who possessed the gift of crystal-seeing; she and Mrs. Clegg were upon terms of intimacy. One day the seeress said, “Let us see what your husband is doing!” She then looked into her crystal, and described “a road and a gate near a bridge, and the whole landscape, also Clegg standing beside the gate.” All of which trifling details proved upon subsequent enquiry from Clegg to have been entirely correct, and filled the minds of these simple people with great wonder. Clegg distinctly remembered having stood beside this gate, which was close to a canal bridge at Staleybridge. This circumstance was also much talked about. In after years, when Mr. P., grown into a young man, was master of a large national school at D__, near to Manchester, he discovered that the sexton there, and his son, were crystal-seers. Gradually Mr. P. convinced the sexton of his interest in his occult gift, but not without considerable difficulty, since it was a hard matter to persuade him that any schoolmaster could possibly believe in the magical powers of a crystal! One day, however, in all secrecy and solemnity, Mr. P. was summoned by the sexton up into the ringing-room, where he was presented with a crystal, as a gift, and with a small book, as a loan. The book contained the names of the spirits presiding over the different days of the week and influencing the crystal— as, for instance, Mercury over Wednesday, Venus over Friday, &c. Upon this occasion, the sexton exhibited none of his seership, but Mr. P. himself speedily developing the gift, the two subsequently were accustomed to make use of the crystal together; the sexton “working the crystal”—as it was technically called—that is to say, calling upon the presiding spirit of the day according to the prescribed formula, and directing the class of vision to be sought for in the crystal, whilst Mr. P. would be passive, gaze into the crystal in as abstracted a condition of mind as possible, and relate what passed before him—one, in fact, being the mesmerizer and the other the mesmeree. This mode of “working” the crystal appears to be general throughout Lancashire, and Mr. P. observed that he could always see more clearly in the crystal when under the control of a powerful “worker” than if he exercised his seership alone. He, in his turn, possessed the power of “working” the crystal for other seers. Mr. P. observed with regard to his own gift as a seer, that it had never been developed to its fullest extent; that his visions remained always more or less dim or uncertain, but that during the series of years in which he was accustomed to use his crystal frequently, the crystal appeared constantly full of visions, in fact was never free from them. The “crystals” used in Lancashire are made of glass, about the size of a hen’s egg, convenient in size and form for holding in the palm of the hand. The usual mode of using the “crystal” is to hold it between the thumb and finger very near to one eye, and look through it, with that eye, whilst the other one is shut. 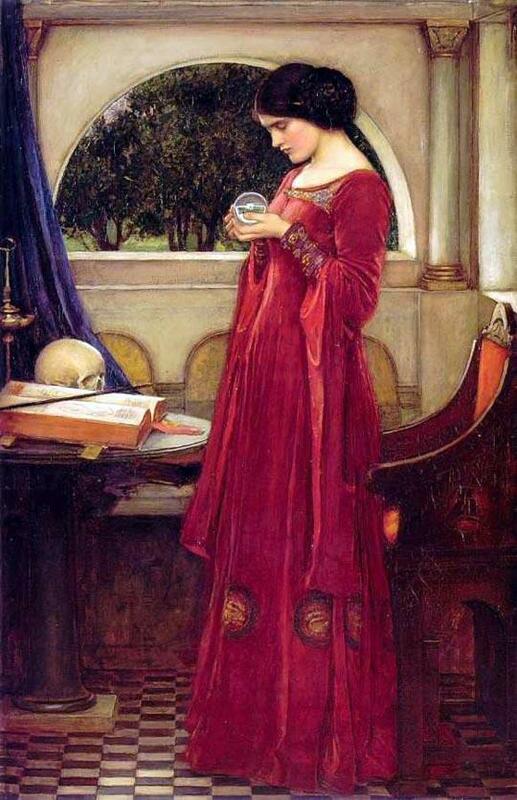 The objects present themselves almost immediately in the glass egg, if the person using it be a seer. Mr. P. bought a second “crystal,” at a shop in Manchester, out of a large basket nearly filled with similar glass eggs. These “crystals” are frequently exhibited for sale in Manchester in quantities, a proof that there must be a large demand for this magical commodity. Mr. P. remarked, that frequent as were his seances with his friend the sexton, their manifestations never rose above the plane of earthly clairvoyance. It is a very common pastime during the long winter nights for those who possess the gift of “seeing” to select certain of their absent friends, whom for the amusement of themselves and others present, they will watch— frequently for hours together—and many is the joke, and hearty the laughter on the morrow, when the seers and their unsuspicious acquaintance meet, and they are told what they were doing and where they were the night before. As a rule, however, the gift of seership is kept a secret from the uninitiated, or at all events amongst the people themselves, on account of the great fear in which they stand of the “police.” When a person joins the fraternity of seers then he first discovers how wide-spread is the gift, and how great the multitude of those who “peep and mutter.” There are numerous professional seers and seeresses, and these modern “Lancashire witches” and wizards are most frequently consulted by the wealthy classes. Mr. P. believes that the crystal-seers in Lancashire may be counted by many hundreds. Years ago, in Stockport alone, he knew of three hundred. Nor does Mr. P. incline to believe that this gift is peculiar to Lancashire alone; he imagines on the contrary that it will be found spread more or less throughout England. Mr. P. mentioned that Martha described to him his present place of residence in G__ shire, years before he had ever seen it, together with various other details, all of which, in course of years, gradually developed themselves into external actual occurrences. Once Mr. P. took a local preacher amongst the Wesleyans, who had greatly scoffed at his belief in crystal-seeing, to witness the power of this woman. The preacher had always declared that if once he came and talked with his friend, that he should set him all right, and upset all such foolish fancies.” They together visited Martha. Upon this occasion, it happened that it was Martha’s son, the lad who worked in a neighbouring brick field, who acted as seer. Being only just returned from his work, and tired, he was at first disinclined to exercise his gift; after some persuasion, however, he consented to do so. The local preacher (whom we will call Mr. L.) asked for a description of the place where he himself worked at his trade. This place was a curious one, with a good deal of unusual and intricate detail about it; and in it lately had occurred a robbery, regarding which he was at that time considerably troubled. To his surprise, the most accurate description of the place was given, even to its steps up and steps down, and of the wooden shed outside; also, the way was described by which the robbery had been effected. L.’s astonishment was great. He next proceeded to enquire whether the boy could see a little son of his, who was at a grammar school far removed from that neighbourhood, giving no clue as to his son’s appearance or whereabouts, any more than he had done in the matter of the workshop. The bricklayer’s lad had scarcely looked into the crystal before he exclaimed, as if highly amused, “Ay, by gum! what a queer cap he has got on!” This referred to the square collegiate caps worn by the boys at this grammar school. L. was greatly impressed by this recognition of the cap, and returned home with Mr. P., fully convinced that “there was something in crystal-seeing.” He talked everywhere about his experience; indeed, he made the acquaintance of a seeress in his own neighbourhood, who, exhibiting further wonders, fully completed his conversion. Years afterwards, when the “boy in the square cap” was grown into a youth and went to college, he also, interested in “crystals” like his father, borrowed one from Mr. P. and took it with him to Cambridge. There one day he put it into the hand of the daughter of his bed-maker, who when she looked into it, instantly proved to be a seeress, and to her own surprise and that of the young man himself, described with great accuracy the place from whence the crystal had been brought. Mr. P. also lent one of his two crystals to two schoolmaster brothers, who taking it home with them directly discovered that the wife of one of them was possessed of the gift of seeing…. By-and-bye the infant-school mistress became infected with Mr. P.’s belief in crystal-seeing, and wrote concerning it to a sister who lived in the north of Yorkshire, some seventy or eighty miles away. The sister was a most positive sceptic, and disbelieved the whole matter, was in fact disgusted by it. The sister out of Yorkshire having come to D__, it was arranged that a party including both sisters should visit Martha without giving her any previous notice. Having arrived at the house of the seeress, the party arranged themselves around the table and it was agreed that the sceptical sister should take the initiative and ask all questions. Forthwith she proceeded to make enquiries from Martha concerning her home in Yorkshire, as to how it was situated, how many windows there were in the house, what was the shape of the garden, &c., &c. All the answers being remarkably correct, the seeress next described with careful minuteness a somewhat singular pony-carriage, but one particular she declared that she could not describe; this was the exact colour of the horse. It proved that neither could the Yorkshire lady herself describe the colour of this animal; she said that it was a curious “mottle” for which she knew no name. Nevertheless no impression whatever was made by Martha’s seership upon-the sceptical sister. As in the former case of the scripture-reader, a sceptic she had gone thither and a sceptic she returned. Such are the chief facts related to us by Mr. P., who interspersed amidst his crystal-seeing reminiscences, certain curious experiences of hauntings and knockings in Lancashire, to which we may possibly refer on a future occasion. Our friend, Mrs. O., confirmed Mr. P.’s statement by her own recollections of Manchester life. At the time Mrs. O. resided with one of her brothers in Manchester, she, like most well-educated persons of the nineteenth century, entertained the profoundest contempt for the so-called supernatural, and paid, therefore, but little need to various curious stories which floated around her. Since her residence in Manchester having become somewhat less respectably sceptical, she has regretted her inattention to these tales, and especially being only able to recall the outlines of the following little history. Alice G., a young woman who was occasionally employed as assistant in washing in the house of Mrs. O.’s brother, told a servant there that she had been to consult “a woman who looked into crystal,” and that, amongst other things, she had seen, and described to her the young man whom in course of time she was destined to marry. That subsequently she went with a friend to Liverpool by an excursion train, and that whilst walking with her upon the sands, they encountered, with another young man, the identical predestined lover beheld in the crystal; that, as in the crystal, his back was at first turned towards her, but that instantly, and before he turned round, she had recognized him, and that he was a sailor as had been described to her. It appears that the two young men entered into conversation with the two girls, and invited them to take a sail with them in a boat, which invitation they accepted. An acquaintance thus sprang up, which ended in Alice G. engaging herself to marry the young sailor. Mrs. O. knew Alice well, had heard of this vision in the first instance, and of her subsequent engagement, but leaving Manchester, had not heard whether the marriage had been accomplished. The last incident of which she recollected hearing in this humble romance, was, that Alice had again been to consult the seeress. She had heard nothing for a considerable time from her lover, and was beginning to fear that he was either dead or had deserted her. The seeress after consulting her crystal, assured her that she had seen him; that he was both alive and true to her; that he was across the seas in a curious country, which Alice thought must be China; that he had written repeatedly to her, but that his letters had been kept back by his sister, who lived in Liverpool, and desired to break off the engagement, as she considered Alice much “beneath” her brother. The idea that Mr. P. could “boost the signal” with another “worker” of the crystal is an intriguing one, reminiscent of placing a foot on the foot of a seer to share in their visions. And, well, large baskets of glass eggs being openly sold in Manchester? I picture buyers taking them home to the wife for darning eggs. Were they all just for crystal-gazing? It sounds as though these were clear glass eggs, rather than the milk-glass imitations put under hens. Were they made by the same craftsmen? Lancaster long had an uncanny reputation, if the “superstitions” about witches, boggarts, Druids, fairies, wizards, and cunning-women recorded in 1867 in Lancashire Folklore Illustrative of the Superstitious Beliefs and Practices, Local Customs and Usages of the People of the County Palatine are to be believed. The egg-shaped glass is mentioned only briefly in this book. Is the vision of a whole nest of “Lancashire witches” all fondling their scrying eggs a little too good to be true? Other scrying techniques: a glass of water, a magic mirror, and a bowl of water and dirt.